British Airways (0344 493 0787; ba.com) flies four times a week from Heathrow to Krakow’s John Paul II airport, 12km west of the city centre. BA competes with easyJet (0330 365 5000;easyJet.com) from Gatwick, Bristol, Edinburgh and Liverpool; Ryanair (0871 246 0000; ryanair.com) from Stansted, Manchester, East Midlands, Liverpool, Birmingham, Edinburgh and Leeds/Bradford; and Jet2 (0800 408 1350; jet2.com) from Newcastle. Bus 208 or 292 (2.80PLN/£0.50), run four times hourly, and take 20 minutes to reach Dworzec Glowny Wschod (1), which is approximately 10 minutes’ walk from Market Square. Krakow is easy to negotiate. Its centre, comprising the old town and Wawel Hill (2) where the Royal Castle and Cathedral sit, are hemmed in by the Vistula on one side and the Planty – a green belt of parks which replaced the city walls in the early 19th century – on the other. To understand the beating heart, and history, of the city, go first to the magnificent Market Square (Rynek Glowny) in the old town, where you’ll find the main tourist office (3) at Rynek Glowny 1-3 (00 48 12 4337310;krakow.pl; 9am to 7pm daily). The square is dominated by the asymmetrical spires of St Mary’s Church (4). As you listen to the bugle playing to mark each hour – with its abrupt ending which signifies and commemorates the bugler’s death from a Tatar arrow in 1241 – you understand that this is a country whose spirit, despite repeated invasion, has never been broken. Hotel Copernicus (5) at ulica Kanonicza 16 (00 48 12 424 34 00;copernicus.hotel.com.pl) stands on Krakow’s oldest street. Its Gothic façade is easily spotted among the jumble of Renaissance palaces. Beautifully converted to a 29-room hotel, with swimming pool in the medieval cellars and frescos from the 15th century on the walls, this was where the astronomer Nicolaus Copernicus stayed when in town – doubles from 833 PLN (£152) room only. The beautifully decorated Hotel Gródek (6) at ulica Na Gródku 4 (00 48 12 431 90 30; donimirski.com) abuts the medieval convent of the Dominican sisters, minutes from Market Square on a tranquil cul-de-sac. It offers roof-top dining with views over Krakow’s skyline and doubles from 610 PLN (£109) with breakfast. The Hotel Polski pod Bialym Orlem (7) at ulica Pijarska 17 (00 48 12 422 11 44; donimirski.com) is in an excellent location by St Florian’s Gate. This ancient hotel has recently been renovated to produce adequate, if not design savvy, accommodation – doubles from 350 PLN (£62), with breakfast. Snack on traditional obwarzanki (Krakow’s take on a bagel which is now on the EU’s protected food list), sprinkled with poppy seeds and a little salt at any one of the cafés around the Rynek Glowny (3) before heading south, out of the square, along ulica Grodzka to Wawel Hill (2) (00 48 12 422 5155; wawel.krakow.pl; open daily 9am to 7pm), a symbol of national pride which rises above the city and is home to both the Royal Castle and Krakow’s 14th-century cathedral (katedra-wawelska.pl). 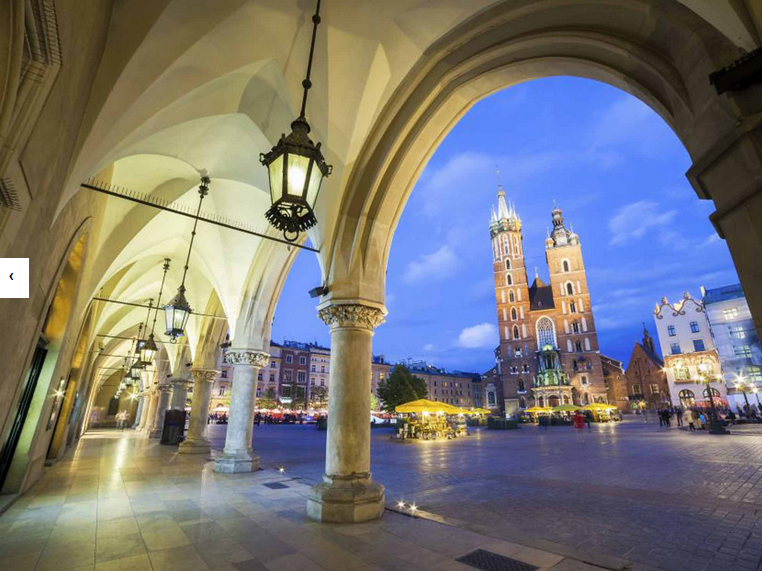 Although the capital of Poland was moved from Krakow to Warsaw at the end of the 16th century, royal coronations and funerals continued to take place here, with many dignitaries buried in the cathedral which houses the relics of Saint Stanislaw, the nation’s patron saint. The Renaissance castle currently houses Leonardo da Vinci’s beautiful painting, Lady with an Ermine. Exhibitions within the Royal Castle require separate tickets (from 3PLN/£0.50 to 25PLN/£4.50, depending on which one you visit) and can be reserved at 00 48 12 422 16 97. Be aware that visitor numbers are restricted. The cathedral is open from 9am to 5pm, Monday to Saturday, and 12.30pm to 5pm on Sundays. The castle is open from 9am to 5pm daily; but only to 1pm on Mondays (wawel.krakow.pl). . . . .